It's 10:30 a.m. on a Tuesday at the St. Regis hotel in Miami Beach, and (what else is new?) Mario Balotelli is drawing a crowd. In exactly one week Super Mario will meet Pope Francis, who will single out Balotelli for a private-audience from among a group that includes Lionel Messi and the Argentine and Italian national soccer teams. But here in this Balo-benighted swath of Florida the story is different. 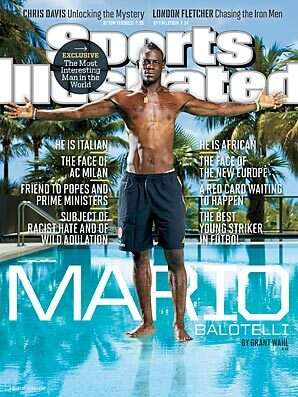 Posing for an SI photo shoot, the 23-year-old star forward of Italy and AC Milan is towering -- 6'?2", shirtless, Mohawked, arms extended wide -- on a plexiglass platform that makes it look as though he's walking on the liquid surface of a swimming pool. Perhaps the pope would approve. Perhaps not. Gawkers gather and snap cellphone photographs. One tourist, bare-chested and pot-bellied, takes a stab at the subject's identity. "Shoot, is he a politician?" the man asks, his voice amply 'Murcan. "My wife says I should know him." What exactly there is about the scene that causes him to think politician is left unsaid. But the notion that anyone can be anything in America fascinates Balotelli, the most interesting man in the world (soccer edition), by turns a national hero and the target of national prejudice, who was born in Sicily to Ghanaian parents but (by law) couldn't become an Italian citizen until he turned 18. On Balotelli's rollicking Twitter feed (@FinallyMario), which includes photos with everyone from the Pope to his new pet piglet, he tagged President Obama with a happy birthday wish and invited him to Milan's Aug. 7 game in Miami. "I've never cared about politics, but I think he is a great man," says Balotelli, holding court in English back in the hotel. He's wearing diamond earrings the size of grapes, a trucker hat bearing an African lion and the word king, a scoop-neck T-shirt that shows off his rippling muscles and, this being Florida, jorts. "Obama can be like a new start for everybody," Balotelli goes on. "Just the fact that he's black and he's the first one." A new start for everybody. In terms of identity, at least, there's a parallel with Balotelli, the first black Italian to play in a major soccer tournament. Balotelli made Time's list of the world's 100 most influential people not just because he's one of the most promising, feared and provocative players in soccer, but also because he represents the New Europe, the continuing spread of the black diaspora to countries where there has been scant African influence. In the past decade Italy's population of immigrants -- the majority of them from Africa -- has more than doubled, to 7.5%. What is it like to be black and Italian? "It's amazing," says Balotelli. "And now there are a lot more coming, so I'm not alone anymore." Nor does he go unrecognized in the U.S. any longer, Florida retirees notwithstanding. When Balotelli visited New York City with AC Milan earlier this month, he was swamped by fans as he walked to see the Empire State Building. "Four years ago I came to New York, and nobody stopped me, nobody said anything," he recalls. "Now people are stopping me, asking for my picture and an autograph." With Balotelli, though, even the Empire State Building is fraught with complexity. Before last year's Euro 2012 quarterfinal against England, the Italian daily La Gazzetta dello Sport ran a cartoon depicting Balotelli astride London's Big Ben, swatting away soccer balls like King Kong atop the Manhattan skyline. The newspaper apologized and Balotelli went on to score two thundering goals in Italy's semifinal upset of Germany, but the cartoon was one more example of the racism Balotelli has faced, going back to his childhood in rural Brescia with his foster family (which happens to be white and which formally adopted him at 18). "You can't delete racism," says Balotelli, who has been the target of bananas and monkey chants from fans in Italy and other countries. "It's like a cigarette. You can't stop smoking if you don't want to, and you can't stop racism if people don't want to. But I'll do everything I can to help." In the fun-house world of Mario Balotelli, you never know what's coming next. In the seven days after his walk-on-water photo shoot, Molto Mario appears in a YouTube video playing the national anthem of Italy on a grand piano; scores a devastatingly efficient preseason goal in Miami against the Los Angeles Galaxy; posts Twitter photos of his new two-month-old pig, Super; appears in another YouTube clip throwing down dunks on a basketball court; celebrates his 23rd birthday at his Milan house, which features a giant gold-tile MB45 mosaic fountain and a life-sized statue of himself; announces after further examination of his pig that he "can't find the willy, so I think is a she .?.?. but maybe a he! "; and meets the pope, who apparently finds Balotelli more intriguing than the pontiff's Argentine countryman, Messi. You recently took your Ferrari F12 Berlinetta and drove it around on a go-kart track? "Yeah, the go-kart track is my go-kart track, so I went inside with my car. There are no problems." You played the Italian national anthem on a grand piano on YouTube? "I'm good, yeah?" Is it real? "I have to say yes, of course." Promise? "Promise? No. But I say yes!" You gave a homeless man $2,500 in cash? "No." You drove to a school to confront a bully who made one of your fans cry? "No." You started a fire with your friends in your Manchester house when a firework went off in your bathroom? "Yeah, that's one. But it wasn't me. I got unlucky. It wasn't like my house was on fire. It was just the bathroom, because one firework went the wrong way. It took the curtain, and the curtain got on fire and the smoke went around the house. But we weren't inside. We were outside with the fireworks." You got fined by your team for throwing darts at youth-team players? "I was playing darts, yes, but I never threw darts at anyone." You're tight with AC Milan owner and embattled former Italian prime minister Silvio Berlusconi? "I talk with him, yes. It's not a big relationship, but we speak occasionally." You still have a camouflage Bentley? "No, I gave it to [Milan teammate Urby] Emanuelson. But he took the wrap off, and now it's white." For all the immaturity Balotelli showed at Man City -- the bottle-rocket-fueled bathroom fire; the four red cards over two seasons; the physical altercation in practice with his father-figure coach, Roberto Mancini -- he also enjoyed some transcendent moments. Balotelli was the Man of the Match in City's 2011 FA Cup final victory, scored the first two goals in an epic 6-1 win at rival Manchester United and had the assist on Sergio Agüero's dramatic last-minute goal in the final game that gave Man City the '12 Premier League title. So much attention is paid to Balotelli's wacky behavior that in many ways he's underrated as a player. With his 10 goals for Italy since 2010 and his sterling performances in high-stakes games, he figures to be one of the dominant forwards at next year's World Cup in Brazil. There's no ceiling on his ambitions, either. Balotelli calls raising the World Cup trophy "more an objective than a dream," and he says his aspirations include becoming the best player in the world. "I'm working on it," he says with a grin. Balotelli's hijinks aren't -sinister -- he has never been arrested -- and more often are funny and endearing: the why always me? T shirt he revealed after scoring a goal for City; the time he got tangled up trying to put on his substitute's bib during warmups; his childlike fascination with pet piglets, go-karts and lions. (He's a Leo.) Why, the sweetest moment of Euro 2012 was a photograph of Balotelli celebrating his two semifinal goals against Germany in the stands with his mother, Silvia. At a tournament where the Croatian and Spanish federations were fined for their fans' racist chants at Balotelli, the image of a tiny white woman from Brescia proudly embracing her black son was a stirring rejoinder, the embodiment of a New Italy. Balotelli is shown the photo, which went viral globally, and asked what he thinks about it. He pauses for a moment, studying the image. "With all the sacrifice my parents made in the past for me, maybe I gave them a good emotion. They deserve it," he says. "I tell them evvvverything. Without them I don't know if I'd ever be a football player. Even if I do something special in football and I make a mistake as a person, they're not happy. Because they want their son to be a man first, and then the best football player." Mama Silvia clearly has no problem saying no to Mario. When asked about arranging an interview with his mother, Balotelli smiles. "My mom? You want to call her? She speaks English!" he says, pulling out his cellphone and dialing home to Brescia. Mama, listen .?.?. I'm good, I'm good .?.?. I'm doing an interview with Sports Illustrated, an American magazine. It's important. Could you speak to him in English? A voice like Charlie Brown's teacher's squawks from his phone. Mario nods. O.K., ciao, Mama! Say hello to Papa! Ciao, Mama! "She said, 'No, you know I don't like interviews,'?" Balotelli says. "? 'I just want you to do well.'?" He dissolves into giggles. Balotelli's Ghanaian birth parents placed him in foster care shortly after his first birthday -- he had a series of intestinal surgeries as an infant -- and he says he "sometimes" connects with them, adding that it's "something I never talk about." He was raised by Francesco and Silvia Balotelli, who lived in the Italian countryside. "Brescia is my home," Balotelli says. "It's where I will live one day when I stop playing football. When I'm in Brescia, I'm relaxed." Balotelli says he knew only two or three other black children while growing up. In his neighborhood he faced no incidents of racism as a child, he recalls, "but when you'd go outside, some stupid people said stupid things. Maybe they thought taking the piss out of someone in front of other people makes them stronger or something. Now I think more of it is ignorance, but it's still a bad thing." His outlet was a small artificial-turf soccer field near his house where kids went seven-on-seven and Mario began playing at age three. "On the pitch I'd feel free, like I could do what I want," he says. "Even when I was younger and we were losing, I felt inside that I could change the game. And it was a good feeling. They are the same emotions I have now." When Balotelli was 12, his mother bought him a DVD with highlights of Maradona's career at the Italian club Napoli. Mario studied the way Maradona took free kicks and penalties, and then he practiced them over and over on the field. "And from there I started to shoot penalties like that," says Balotelli, who's a mind-blowing 24 for 24 on PKs for club and country. "It's mental," he says. "You have to be calm and wait for the goalkeeper to move. If the goalkeeper stays, he doesn't have time to go to one of the corners. If he moves, I see him before. It's kind of impossible for him. The only two ways I can miss a penalty are if I'm not concentrating or I shoot [outside the goal]." Balotelli debuted in Italy's Serie A for Inter Milan at 17, but he wasn't yet an Italian citizen. A much-debated Italian law prevents the children of noncitizens from gaining citizenship until they're 18, even if they're born in Italy, as Balotelli was. "That's a stupid rule," says Balotelli, who carried a Ghanaian passport at the time even though he has never set foot in Africa. "I spent 18 years in Italy, and I was not Italian yet. That's why I hope all the guys that are like me and living this are going to be Italian before I became Italian." Balotelli feels more comfortable in Italy than he did in England, but he says his three years away from his family and from his Italian friends were good for him. "I went there as a boy, and I came back to Italy as a man," he says. AC Milan purchased Balotelli from Manchester City for $29 million last January, and he helped the Rossoneri, his favorite Italian team as a child, rebound from a terrible start and qualify for this season's Champions League. Super Mario is beloved by the Milan faithful, who wear his jerseys and scarves bearing his name, but the specter of something darker is always hanging over Italian soccer stadiums. In a game against Roma in May, the referee briefly suspended the match when Roman fans directed racist chants at Balotelli. And by a quirk of the schedule, Milan opens its Serie A season this Saturday at Hellas Verona, which has some of the most notoriously racist fans in Italy. "I hope they won't say anything," says Balotelli. And if they do? "I'll try to score with all my power, and when I score, then I'll say something." What Balotelli won't do, he says, is walk off the field should the racist chants rain down on him. He wishes he could. That's what his Milan teammate, Ghanaian midfielder Kevin Prince Boateng, did last year in response to fan slurs in an exhibition game, with the rest of the team following him down the tunnel. Hailed worldwide for his stance, Boateng soon joined FIFA's new anti-racism task force. But now Balotelli has been told that teams will face punishment if any player walks off the field. "For this stupid rule," says Balotelli, shaking his head, "I will stay on the pitch." By his own estimation, Mario Balotelli has cried twice in the past 10 years: once over a breakup with a girlfriend and once after Italy lost to Spain in the Euro 2012 final. "Those are two different reasons to cry," he says. Perhaps. Perhaps not. In the end it comes down to love. Love of a woman. Love of a country. Less than a year from the World Cup, Balotelli would like nothing more than to be the symbol of triumphant 21st-century Italy, not just to all Italians but to the world. In life, sometimes, it's as though he's standing at the spot for a penalty kick, reading the goalkeeper, deciding which way he should go. Tough guy or sensitive soul? Bad boy or role model? "I don't like to talk much, even when people speak bad about me," he says. "Inside me, I say, Why do they have to think of me that way? But I know how I am. My objective is not that people follow me, but I'm happy that they do. It surprises me how much children like me, you know? If they look at me as an example, I have a big responsibility."